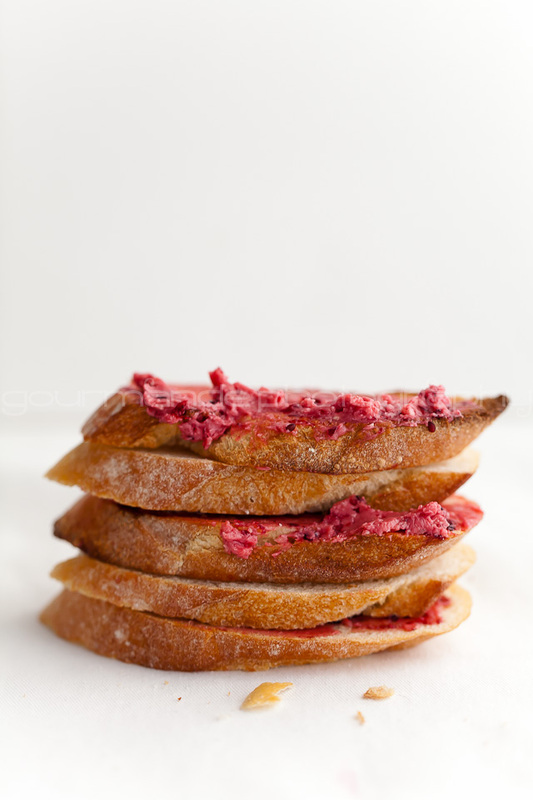 Here's a gorgeous guest post from Sylvie from Gourmande in the Kitchen, a brilliant photographer and great food writer. Her posts always teach me something new, like this how to plan a cheese tasting party or maintaining an indoor herb garden. She is also a very special friend and I'm so glad that our paths crossed. I could say many thing about her but in one word she is 'extra ordinary'. In these series of guest posts I tried to get breakfast recipes from most of my blogging friends. From exotic poached quince, fusion mango pancakes, deep fried Indian chana batura to totally Indian potatoes and pea stuffed paratha, there are so many ways to enjoy this fabulous meal. 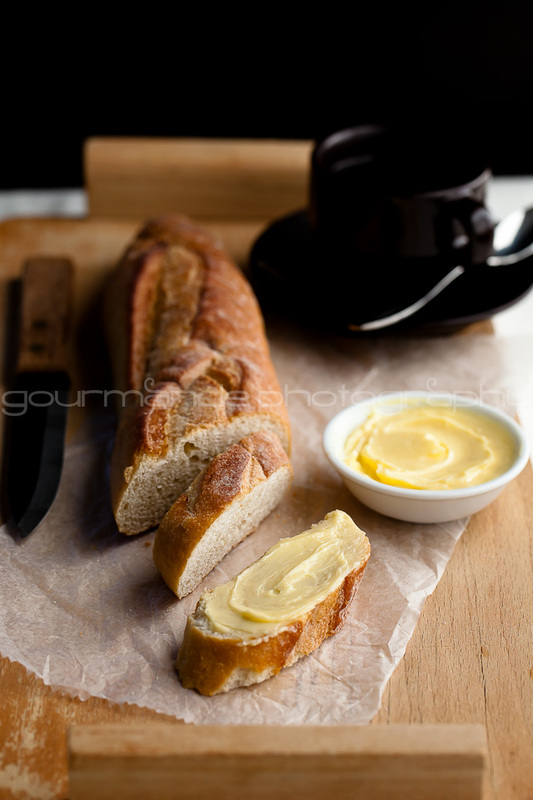 But there is something about a baguette spread with butter that I'm sure finds a connection with everyone. Who can resist that? I certainly can't. And if the butter is homemade and flavored with blackberry, I might just live on breakfast! The distinctive flavor derives from the nature of the cream from which it’s made, and from the bacteria indigenous to the dairies where it's produced. Just as milk inoculated with bacteria yields yogurt, so cream cultured by certain bacteria takes on a form and quality different than in its virgin state. The resulting cultured cream is nuttier and more flavorful than the sweet cream from which most mass-produced butter is made. Less sweet than jam, more substantial than plain butter, blackberry honey butter is a delicate marriage of flavors. The taste is soft and subtle and the texture light yet luscious. Plump blackberries add sweetness, depth and a jewel-like color to the butter. I’m smitten with this silky, not-too-sweet butter with personality; it has a bit of edge a smidgen of sass. It's voluptuous and the perfect match for those morning tartines; a truly joyful way to start the day. Place berries, honey and lemon juice in a small saucepan over medium-high heat and bring to a boil. Reduce heat and simmer for five minutes or until thickened and syrupy. Remove from heat and cool completely. Day One: In a clean glass container combine the cream and yogurt. Cover loosely and place it in a warm part of the house ideally around 75F (24C). Let rest for 12 -24 hours, until the mixture is thick. If the temperature is more than 75F (24C) it will take close to 12 hours to culture. If the temperature is less than 70F (21C) it may take up to 24 hours. Once the cream has thickened, transfer the container to the fridge to chill. Day Two: Once the cultured cream is thoroughly chilled, fill a bowl with ice water and set aside. Put the cultured cream in a mixing bowl or stand mixer with the whisk attachment. Beat the mixture on high until the cream breaks, reduce speed to low and continue mixing until fully separated into butter and buttermilk. Strain and save the buttermilk for baking. Transfer the remaining butter to a clean bowl and pour the ice water over it, pressing the butter with a spatula or your hands to remove as much residual buttermilk as possible. Pour out the liquid and repeat as many times as needed until the water is completely clear. Continue pressing the butter against the sides of the bowl to get as much water out of the butter as possible. Add a pinch of fine sea salt now, if desired. If you making the blackberry honey butter, beat the cooled blackberry sauce in with the butter until smooth and creamy. To store the butter, roll into logs or pat into squares in wax paper and keep in the fridge for up to 2 weeks. Oh my! This looks delish. What a unique combination of creamy and fruity. Love it. Beautiful guest post and gorgeous gorgeous photos!!! another great guest post! if you'll ever be interested, I'd be more than happy to contribute with a guest post to your blog! I so very much love this! Mmmmmm. This looks wonderful! I love the idea of making a compound butter with something sweet! I bet this would be fantastic even in savory preparations. If this is served to me for breakfast I doubt if I will skip ever :) Sylvie is truly extra ordinary like you mentioned.I am going to definitely try this sometime. Thanks for sharing ! I can't agree more with you Kulsum. Love Sylvie and her blog. Every time I read her post I learn something new and that is what happened today. Idea of using heavy cream sounds fantastic to me. Back home my mom used to collect cream from cow's milk and it takes a week or so to have a cup of cream. Now I can't wait to make butter at home. Wow what a great lesson in the French breakfast -- I've learned so much from this guest post. Thanks to both Kulsum and Sylvie but this mouthwatering post! I am just drooling here- such gorgeous photos and I love the recipe(s)! Oh I fell in LOVE... This is beautiful!! Sylvie, as always, the photos are fanastic! I think bread & butter is a favorite breakfast option around the world.A beautiful post by both of you! I love the pretty pink color of the homemade butter with blackberries- A color I m in love with :) Breakfast cant get better than this! With every post Sylvie teaches me a new thing! Great post and what gorgeous photos. Good job with the guest post contributors Kulsum!! 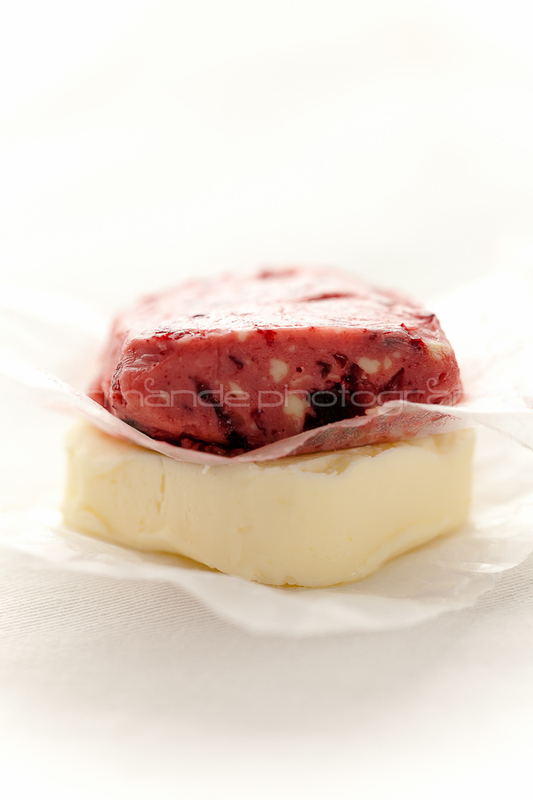 This is a wonderful post, the photos are gorgeous and this butter just sounds amazing!! Can't wait to try this cultured butter! As always gorgeous photography Sylvie!! Ms. gourmanade in the kitchen is awesome and what a wonderful guest post! 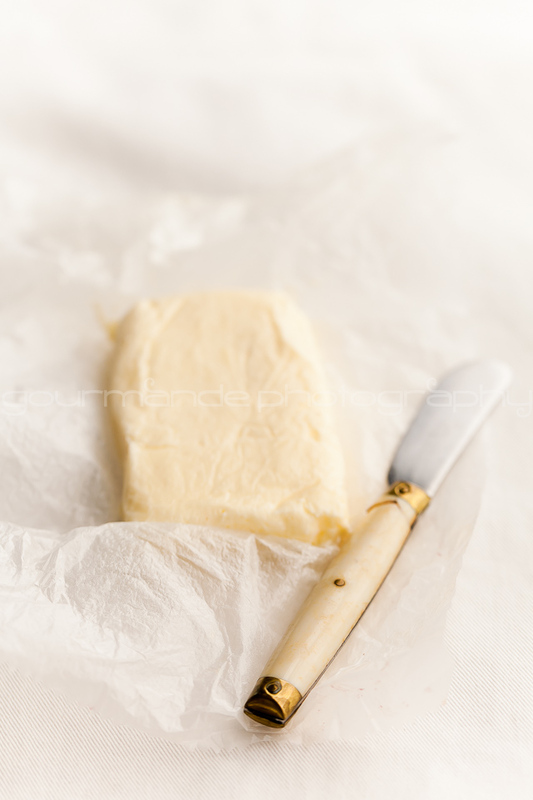 I love the butter-it just looks so amazingly simple yet delicious! Beautiful beautiful post...Gourmanade in the Kitchen! I have never thought of making butter on my own. 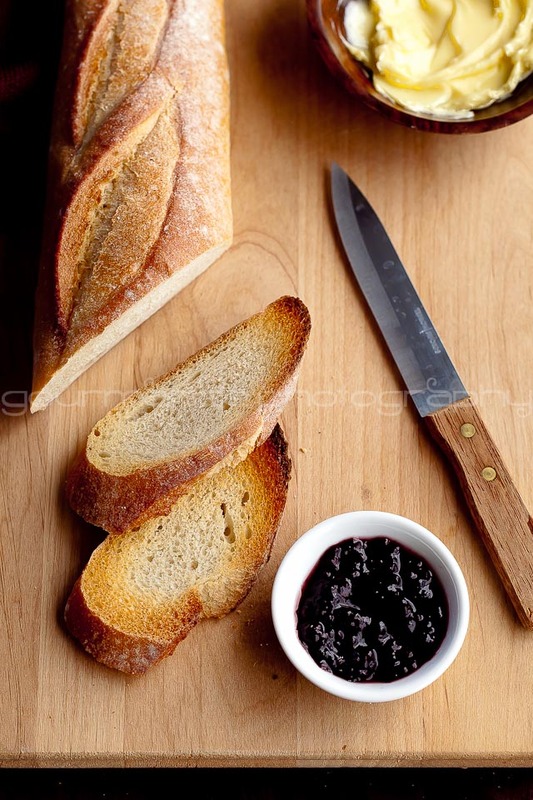 Such a great recipe and I'd love to try blackberry honey butter! Thanks Kulsum for introducing her and her blog. I'll go check out her site! these photos need o be somewhere in a magazine! great shots! Hello Nicki, the apple cinnamon idea sounds great=) I'm looking forward to hear about your results.